What a whirlwind these past few days have been! I apologize for being slightly M.I.A. but I took the latter part of last week off so that I could focus more on wedding planning and my bachelorette party. We received our handmade Etsy invitations and absolutely love them! They are very simple, but that's exactly what my fiancé and I wanted. Our wedding colors are black, white, and blush. The three layers of cardstock reflect that, as well as our seashore ceremony and reception that will follow. I am hesitant to post this because of the personal information (my fiancé joked we will have some wedding crashers) but I wanted you guys to see it anyway. I know some of you are planning your own weddings, and it's always nice to get an idea for your event. Although Nate isn't in the military, we are able to do a beach wedding on Camp Pendleton military base because his dad is retired from the navy and both of his parents still work in that field. Three more months until the big day. Time flies when you're planning! 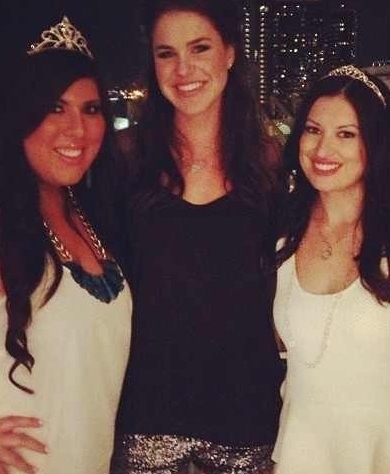 My joint bachelorette with my best friend took place this weekend, and it was hysterical! I think considering the possibilities, our friends respected our wishes and kept the debauchery to a minimum. We stayed at the Hard Rock in San Diego, followed by dinner at the Marble Room. BOTH were amazing, especially the service and would recommend either if you're ever in the area. Our friend set up the suite we stayed in with party bags, candy, and cupcakes. So sweet of her! I gave my fellow bride-to-be a matching silver heart ring from Catbird. Grainy night picture. I wish I had taken more, but I was too busy having fun to bother. One wedding event down, a few more to go! Your wedding invitations are beautiful. You picked the perfect ones. My wedding invitations really surprised us. We loved the design, but when we got them, they were HUGE! Bigger than a regular notebook (8x11). A dear friend offered to design and produce (he studied graphic design and works at an editorial) and I guess we just never discussed the size :p Hubby (fiance) and I just figured they were "normal" size, like any greeting card and my dear friend forgot to mention he had something completely different in mind. I think they ended being A BIG JOKE to many guests. Now, we just laugh about it, still a bit embarrassed about it. I bet they were beautiful though! I've seen big invitations before and I actually loved them! Ours are standard size although these pictures make them look huge! Love your invitations...so pretty and coastal...perfect for the occasion! Etsy really is a great place to shop for personalized and creative items. The invitations look beautiful. You are so right about their simplicity - simple is best. Aw, I love your invitations...so pretty! Your party sounds like a blast! And the invitations are gorgeous -- and SO you! Love the colors! This is such an exciting time and I'm so happy for you. Soak up all of the fun that is to come. why are you having your guests rsvp so far in advance of the actual wedding date? Your invitations are gorgeous! I love your colors too! We had guests RSVP that far in advance too because of out of towners and we could realistically know how much food, etc, to have on hand. Your bachelorette party looked like a lot of fun too!